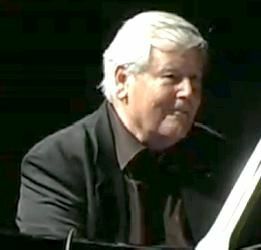 Piano player, composer and arranger, George Gruntz was born on June 24th, 1932 in Basel, Switzerland. He started his jazz career in the fifties. He has been director of the Zurich Konzerthaus as well as artistic director for The JazzFest in Berlin. He has been playing under different configurations (trios, duos) but his most famous ensemble was the George Gruntz Big Band, always plenty of superb musicians along several decades. It´s almost impossible trying to trace their lineups, so I´ll just mention the few ones I know. George Gruntz passed away on January 10th, 2013 in his hometown Basel, due to illness. He'll be missed. THE INTERNATIONAL YOUTH BAND #? Later, it was released the live album At the Montreux Jazz Festival. They released in 1972 a live album called Trombone workshop. George Gruntz was the founder of Piano Conclave, with other jazz pianists, such as Joachim Kuhn, Jasper Van´t Hof, etc. They recorded the album The Band, live at Zurich. Can someone help me here, please? Was maybe Benny Bailey also part of the live lineup? + maybe others unknown to me. Help! But I´d love any help with more details. Some concerts had famous guests, such as Phil Woods, John Abercrombie, Dino Saluzzi or appearances by former members Franco Ambrosetti or Peter Erskine. Pheeroan Ak Laff, Flavio Ambrosetti, Franco Ambrosetti, Jay Anderson, Ray Anderson, Benny Bailey, Dave Bargeron, Art Baron, Django Bates, Marcus Belgrave, Americo Bellotto, Jerry Bergonzi, Tim Berne, Luciano Biondini, Seamus Blake, Urs Blochlinger, Luis Bonilla, Allan Botschinsky, Billy Branch, Randy Brecker, Gerry Brown, Sam Burtis, Vincent Chancey, John Clark, Kim Clarke,... up to 172 musicians. Comments: Recorded in 2 days in April 1964. Comments: Recorded in March 1965. Comments: Recorded live in June 1967. Comments: Recorded in July 1968. Comments: Recorded in July 1974. Comments: Recorded live in March 1974. Comments: Recorded live in March 1976. Comments: It included two tracks recorded in studio in September 1978, and two live tracks recorded in October 1978. Comments: Recorded live in April 1980. Comments: Recorded live in July 1982. Comments: Recorded live in March 1981. Comments: Recorded in November 1986. Comments: Recorded in October 1987. Comments: Recorded in May 1989. Comments: Recorded live in September 1989. Comments: Recorded in January 1991. Comments: Recorded live in May 1992, composed by George Gruntz, with libretto by Allen Ginsberg. Comments: Recorded live in November 1992. Comments: Recorded live in May 1995. Comments: Collection of live recording between 1981 and 1995. Comments: Recorded in March and November 1998. Comments: Recorded live in November 1998. Comments: It contains tracks recorded in July 2000, August 1964 and November 1998. Comments: Recorded in December 2000. Comments: Each track is taken from a different date, ranging from 1961 to 2001, with some live tracks. Comments: This album was recorded in 1960, but apparently it wasn´t released properly. It was finally published on CD in 2003 with additional unreleased tracks. Comments: Recorded in December 2004. Comments: Recorded in October 2002. Comments: Recorded in March 2005. Comments: Recorded in November 2007. Comments: Recorded in July 2009. Comments: Recorded live in April 2010. Comments: Recorded in 2011 with the NDR Bigband. Comments: Recorded in March 1971. Comments: Recorded live in September 1971. Comments: Recorded live in June 1969. Comments: Recorded in January 1994 with the George Gruntz Concert Jazz Band. Comments: Recorded in August 1998. Comments: All tracks were recorded in 1959. Comments: Recorded live in June 1970. Comments: Recorded in June & July 1971. Comments: This 2LP includes live performances from 1956, 1958 and 1962, including Louis Armstrong All Stars, Louis Armstrong Newport International Jazz Band (in July 1958, with George Gruntz), Duke Ellington Alumni All Stars with Rex Stewart, Ben Webster & Billy Strayhorn, Duke Ellington Orchestra, Benny Goodman Orchestra with Jimmy Rushing, The Newport All Stars, Willie ´The Lion´ Smith, Teddy Wilson, Thelonious Monk, Sonny Stitt, Gerry Mulligan, Dave Brubeck Quartet (in July 1963, with Joe Morello) and Miles Davis. Comments: Recorded live in June 1982, featuring among others, Philip Catherine Duo, Lester Bowie Ensemble, and Radio Big Band Berlin (featuring George Gruntz). Comments: It includes tracks recorded from 1960 to 1963. 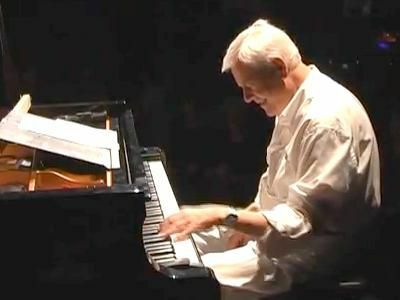 Comments: Recorded live at the 25th anniversary of the Montreux Jazz Festival, in July 1991, featuring The Gil Evans Orchestra and The George Gruntz Concert Jazz Band, plus some additional musicians. Comments: Gigantic 20CD boxset comprising Miles Davis appearances at Montreux Festival during so many years: 1973, 1984, 1985, 1986, 1988, 1989, 1990 and 1991. Comments: Recorded in September 1964. Comments: It contains tracks recorded in 1958, 1959, 1960 and 1968. Comments: Compilation with some rare tracks. Disclaimer: I don´t own or upload any of the videos linked here. I just include links to live videos that are already available, in order to show the work of this musician. Anyway, if someone feels that some link shouldn't be included, please write me at the email address shown below. And if you know of more videos featuring George Gruntz, please, also write me with the link. Featuring: Art Farmer, George Gruntz, Daniel Humair, Henri Texier. Featuring: Franco Ambrosetti, Ray Anderson, Art Baron, Sharon Freeman, George Gruntz, Joe Henderson, Howard Johnson, Sheila Jordan, Lee Konitz, Bob Moses, Ernst Ludwig Petrowsky, Enrico Rava, Mike Richmond, Larry Schneider, Manfred Schoof, David Taylor, Tom Varner, Kenny Wheeler. Featuring: George Gruntz. most of them unknown to me. Featuring: Peter Erskine, George Gruntz, Joe Henderson, Sheila Jordan, Mike Richmond. some others unknown to me. Featuring: Ray Anderson, Art Baron, Sharon Freeman, George Gruntz, Chris Hunter, Howard Johnson, Bob Malach, Paul Motian, Ernst Ludwig Petrowsky, Mike Richmond, Arturo Sandoval, Manfred Schoof, Marvin Stamm, David Taylor, Tom Varner, Kenny Wheeler. Featuring: Miles Davis, Kenny Garrett, George Gruntz, Quincy Jones, Mike Richmond, Wallace Roney, Grady Tate. Rest of the musicians unknown to me. Featuring: Dave Bargeron, Art Baron, Ellery Eskelin, Sal Giorgianni, George Gruntz, Tom Harrell, Joe Henderson, Chris Hunter, Howard Johnson, Elvin Jones, Earl McIntyre, Adam Nussbaum, Mike Richmond, Larry Schneider, Alex Sipiagin, Lew Soloff, Steve Turre, Jack Walrath. Featuring: George Gruntz, Elvin Jones. most of them unknown to me. Featuring: Dave Bargeron, Sal Giorgianni, George Gruntz, Chris Hunter, Howard Johnson, Earl McIntyre, Mike Richmond, Larry Schneider, Alex Sipiagin, Lew Soloff, Erika Stucky, Steve Turre. some others unknown to me. Featuring: Ray Anderson, Dave Bargeron, Luis Bonilla, Clark Gayton, Sal Giorgianni, George Gruntz, Chris Hunter, Donny McCaslin, Mike Richmond, Larry Schneider, Steffen Schorn, Alex Sipiagin, Terell Stafford, Scott Wendholt, Jens Winther, Raphael Woll. Featuring: George Gruntz, Herbie Kopf, Raphael Woll. Featuring: Dave Bargeron, Sal Giorgianni, Danny Gottlieb, Tatum Greenblatt, George Gruntz, Chris Hunter, Howard Johnson, Elliot Mason, Earl McIntyre, Adrian Pflugshaupt, Larry Schneider, Alex Sipiagin, Marvin Stamm, Gary Valente, Arie Volinez, Jack Walrath. Featuring: George Gruntz, Tobias Preisig. Featuring: George Gruntz. Rest of the musicians unknown to me.